There is little doubt the government has orchestrated the anti-occupation violence of recent days to try to break the mass democracy protests. The police stand back and allow attacks, or stage fake arrests only to release the criminals! Front groups like ‘Caring Hong Kong Power’ and the new ‘blue ribbons’ are funded and created by the CCP. At the same time, police have used deceitful and provocative manoeuvres to drive in truckloads of tear gas, rubber bullets, and other weaponry to the Chief Executive’s Office in a game of terror against the peaceful protesters. The government tried to use its ‘A team’ when the police unleashed their gas attacks on 28-29 September. 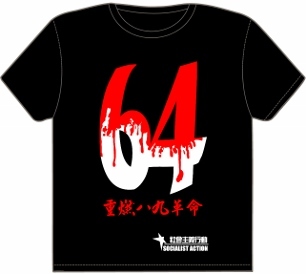 When this failed, and produced a backlash, they use their “B team” of pro-CCP groups backed up by triads. 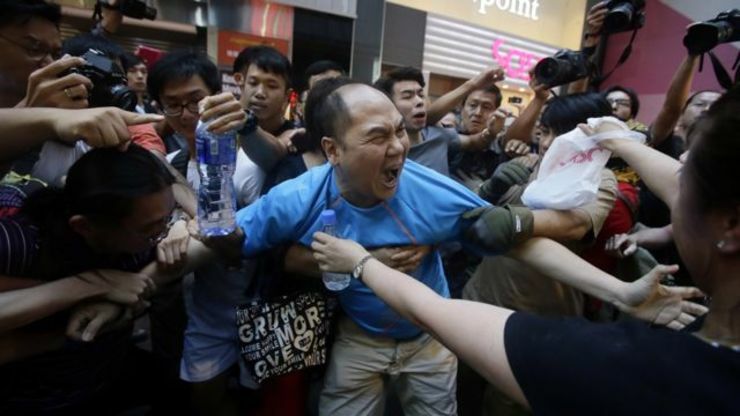 In Mong Kok, these attacks have been answered heroically, especially when 10,000 ordinary citizens mobilised to oppose the violence on Friday evening. This is an incredible response, given that statements issued by the ‘official’ leaders of the movement – including the Federation of Students and youth NGO Scholarism – called only for people to gather in the main protest site at Admiralty. Socialist Action members, who have been an active in the Mong Kok occupation say these occupations need to be defended, and this must be organised democratically by forming action committees to coordinate the day-to-day struggle. The decentralisation of the occupations into three or four sites was a response to the vicious police offensive of September 28-29 that aimed to break the current movement. This was a brilliant and wholly improvised tactical response from the protesters that wrong-footed police commanders. The police strategy for crushing the occupation movement had been based on the notion of ‘Occupy Central’ (a protest idea that was delayed so often it never actually materialised) – i.e. for just one site, which is easier for the police to attack and defeat. Pro-government “blue ribbon” supporter lashes out at occupiers in Mong Kok. Pressure is also emerging within the ‘Umbrella Movement’ from sections of its leadership to call off the movement or make concessions to the government in the name of “keeping public support” – concessions that would weaken the movement and make it harder to win. The ‘moderate’ pan democrats have always dreaded mass struggle, which they know can be radicalised and slip beyond their control. The current violent attacks against the mass movement are part of a government strategy, as Socialist Action warned would be the case, to increase the pressure on the ‘moderate’ pan democrats and groups like ‘Occupy Central’ (OC) to seek a way out through ‘compromise’. But any compromise with CY Leung and the CCP can only involve peripheral concessions. This is not a strategy to win ‘full democracy’ as demanded by the masses. 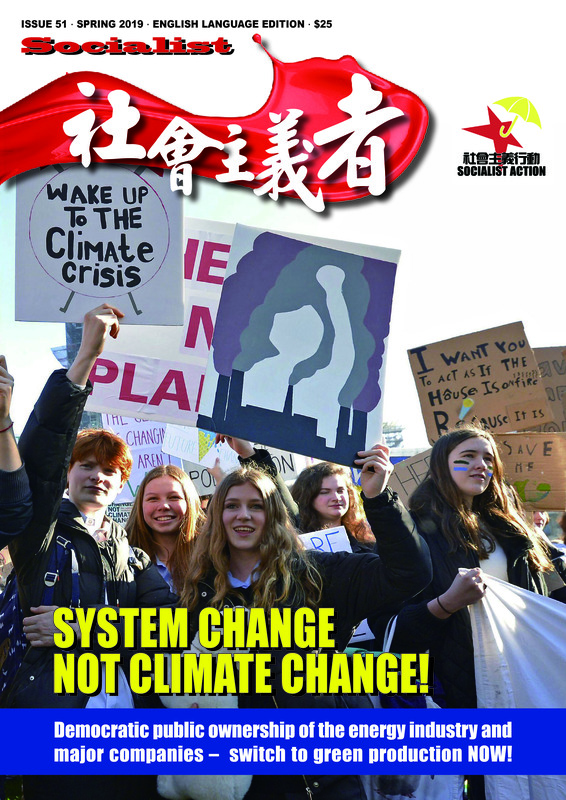 Too many times in Hong Kong, a mass protest movement has been left empty-handed because the leaders are not under democratic control and, while there are thousands of single-issue NGOs, there are no genuinely mass organisations, especially workers’ organisations, that can hold these leader to account. Too often the pan democratic leaders have walked into the trap of fake dialogue with the CCP dictatorship or its local minions – dialogue that only has one purpose: to get people off the streets without offering any real or meaningful change. Some voices among the ‘moderates’ are signalling the movement should now step back. For them, “talks” are the way out. This would be disastrous. This would mean throwing away the enormous momentum of the mass struggle and letting the scheming government off the hook! The successes of any struggle, especially such a historic movement, have to be measured by concrete gains, not empty promises. This means nothing less than the downfall of CY Leung’s cruel and corrupt government, and a refusal to accept any successor other than through a genuinely democratic election, without the CCP’s Big Business-dominated nomination committee. There must be no restrictions on which candidates can stand. As far as Socialist Action is concerned, this also means the replacement of the current rubber stamp legislature with a genuine people’s assembly, with its members fully elected, subject to popular recall, and paid only a skilled workers’ wage. As in Scotland’s recent referendum, the voting age should be cut to sixteen, with young people having shown beyond any doubt the crucial role they play in society’s political development. Socialist Action links the democratic struggle to the need to fight capitalism, particularly the need for a new mass workers’ party to coalesce from among the working class and left layers of this movement. This is needed to challenge the dictatorial economic power of Hong Kong’s tycoon families and build support for a socialist alternative with democratic public control over the banks and property companies as the only way to relieve the unbearable burden of housing costs – officially the ‘most unaffordable’ in the world – as well as the scourge of poverty, stagnating real wages and privatisation of public services. Pass the umbrella to China! The struggle must also be spread to the mainland, by supporting illegal workers’ struggles in China’s sweatshops and the fight against state repression. This is the only viable strategy to defeat the CCP dictatorship, which today constitutes a seemingly insurmountable ‘roadblock’ for democracy in Hong Kong, as well of course as China itself. It is a big mistake to practise self censorship (not to “anger” the CCP) and to separate the two struggles. This actually strengthens the hand of the Chinese regime. The ‘umbrella’ must be passed from Hong Kong to China, and the sooner the better. But this requires a programme based on the interests of the working class and the poor, in China and Hong Kong. The mass democracy protests must be organised on democratic lines, with elected action committees open to all participating groups to run the occupations, coordinate with striking workers and students, and to take all major decisions on the future tactics, including what attitude to take towards eventual concessions or offers of talks from the government. The largely spontaneous and loosely organised ‘Umbrella movement’ ran with an impressive energy and smoothness in its first days, but this model of conducting a mass struggle is now being severely tested by the government’s terror and violence campaign. So the issue of democratic organisation is extremely urgent. The struggle needs action committees in every occupation, to coordinate mobilisation and especially to organise self-defence, with similar democratic bodies established in schools and workplaces to build the strike movement. These committees must decide tactics and which political responses are needed through open and democratic discussions. Only a fully democratic movement is capable of defeating the government. No more fake deals and negotiations: Full democracy now! Support and extend the ‘Umbrella Revolution’ – build democratic action committees to decide the next steps and organise self-defence against government orchestrated violence! Continue and build the schools strike! For a fighting independent school student union! Down with one-party CCP dictatorship! Down with the capitalist tycoons that enjoy its protection! The democracy struggle is also a class struggle – We need a mass workers’ party to fight for socialism! 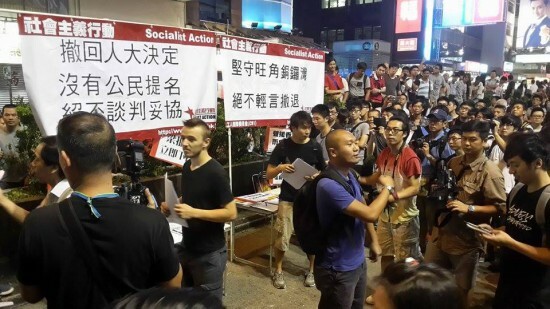 Socialist Action stall in Mong Kok occupation.